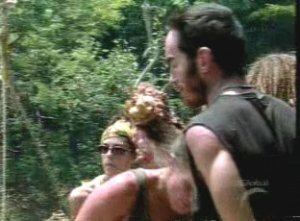 It was episode six in the Amazon, and Tambaqui and Jaburu were competing in one of the most unique challenges in Survivor history. With their hands tied behind their backs, they were supposed to rip slabs of meat off a giant bone and drop the slabs onto a scale. 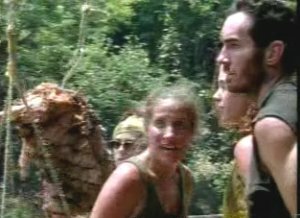 The tribe that compiled the most raw meat in their basket by the end of the challenge won immunity. It was actually quite simple. The entire challenge was a tribute to the eating habits of the most famous carnivore in the Amazon, the piranha, and it also happened to be flat out disgusting. Oh sure, It was a memorable challenge to watch on TV... but it also made you sort of sick watching it at the same time. Like I said, this was just a quick insert shot that was kind of silly, but it never fails to make me laugh. I mean, after all, it really is the oldest principle in the world of comedy. You just can't go wrong with people being whacked in the head by a giant slab of meat.